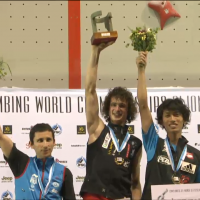 Just three weeks after winning the 2014 Bouldering World Championships, Adam Ondra secured the 2014 Lead World Championships in Gijón, Spain with a narrow victory over Ramon Julian. After taking a few years off from competing to climb the hardest routes in the world, Ondra put the world on notice that he was focusing on competitions this year. Despite a few early hiccups in some of the Lead World Cups, he has thus far managed to win one Lead World Cup, take 2nd at a Bouldering World Cup and now the incredible double in the World Championships. This kid might be good. For the women it was South Korean Jain Kim securing her first World Championship with a stellar performance. Reigning two-time U.S. National champion Delaney Miller finished in 16th. Full results can be found on the IFSC’s website. 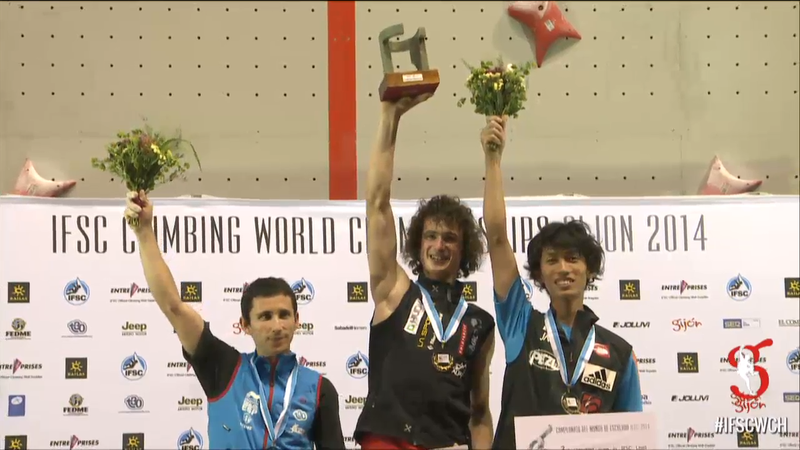 Pretty amazing that Ondra was able to win both bouldering and lead World Championships this year. I think part of it may be the split format that allowed him to rest and focus on each discipline separately. As far as I can tell this is the first year they have done that. Looks like they are going back to the old format for the next two World Championships so this may be the only time we see such a feat. Good for Ondra in recognizing a rare opportunity and taking advantage. Ondra said in interviews that he only trained lead. He just went to Munich to try his luck basically and won. If the Championship is longer like the one in Arco then it’s possible. Maybe not by Ondra but by someone who is on a much higher level than his direct rivals so that even with a drop in performance in the second discipline he is still capable of winning. Leave a Reply to captaincrimp Click here to cancel reply.